Belturbet in Ireland-East is a perfect choice for a great holiday or a fun short break in County Cavan. Find out more about Belturbet below. Fully restored in 1995 and again refitted in 2014 this station Masters house is a Grade one listed building a mere stroll from Belturbet village less than 2 hours from Dublin. It has been lovingly refitted to bring in the modern age with mod cons such as a flat screen TV and free Wi-Fi. The house is ideally situated in the peaceful town of Belturbet on the banks of the Upper Lough Erne and with direct access to the Shannon-Erne Waterway. 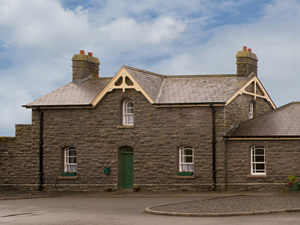 The Main Station Building which is attached contains a museum hosting an interesting collection of railway memorabilia and audiovisual footage of the Cavan and Leitrim railway and the restoration of the station itself.Shop. Pub. Restaurant 264 yards. Beach 65 miles. GF: lounge, kitchen, dining room. FF: double, twin, bathroom with shower over bath.Electricity included , storage heaters, open fire with starter pack, linen and towels included, travel cot, high chair, stair gate, TV, dvd player, fridge with small ice box, microwave, w/machine, internet access, hairdryer, enclosed private courtyard, garden furniture, bbq, off road parking. Pets welcome. Belturbet is family friendly self catering. We have the following details listed regarding Belturbet accommodation accessibility but we would recommend that you always confirm these prior to booking with the owner or operator. Belturbet is a great base to explore the wonders of County Cavan and you will find plenty of activities near by. Belturbet is at Lough Erne, County Cavan. Check out the map below for directions, use the controls to zoom in. If you have stayed at Belturbet why not add your thoughts, comments, pictures to our Facebook page? Don't forget to add the name/town/page link to your comment so its attributed to the correct place. Please keep it polite, we are sensitive souls! Find Cottage Holidays works closely with independent cottage owners and leading holiday travel operators to provide you the widest choice of self catering accommodation across Ireland. Belturbet in County Cavan is available through: Imagine Ireland. If you are heading to County Cavan then check out our guides to local holiday attractions, gardens to visit and county shows to see.